If old, traditional style is a perfect choice for you, take a look at the best-selling North Shore Collection by Ashley Furniture. It’s look brings back the best of the past, recalling grand furniture inside estates, villas and Victorian mansions. This furniture has history, celebrating artisan-rich details, vintage elegance and comfortably aged materials. Also, it’s well-constructed, well-used and has stood the test of time. The North Shore Collection by Ashley Furniture is one of the best selling of old world styles. It has rich, dimensional details, including a mansion-sized scale, solid wood accents, a burnished finish, ornately carved appliques, elegant diamond-patterned veneers, luxurious marble accents, indulgent felt-lined ( or cedar-lined) drawers, plus tapestry-like fabrics and character-rich leather. But that’s not all. This old world look has been updated with new world conveniences. Look for hidden drawers in hidden places, adjustable shelves, three-way light switches, clever cord management and much more. The opulent brown stained finish flows beautifully over the decorative pilasters and ornate detailed appliques to create a rich elegant atmosphere to any dining experience. With the comfort and beauty of elegantly upholstered chairs, this furniture collection takes traditional style to the next level. Transform your dining area with the rich style of the North Shore Dining Room Collection. With a serpentine shaped design and inlay stone veneer tops, this furniture collection takes traditional style to the next level. Transform your bedroom with the rich style of the North Shore Bedroom Collection. The sleek Metro Modern design along with the shining white finish created with “Infinity Edge” 3D press technology which creates smooth edges makes the Culverden Bedroom Set w/ Accent Headboard by Ashley Furniture an exciting furniture collection that is sure to awaken the decor of any bedroom. The Kristyna Living Room Set by Coaster is a vision in white. This sophisticated sofa set is well cushioned for superior comfort and upholstered in luxurious white bonded leather. Classic button tufted back cushions, and sloped rolled arms bring the look together. 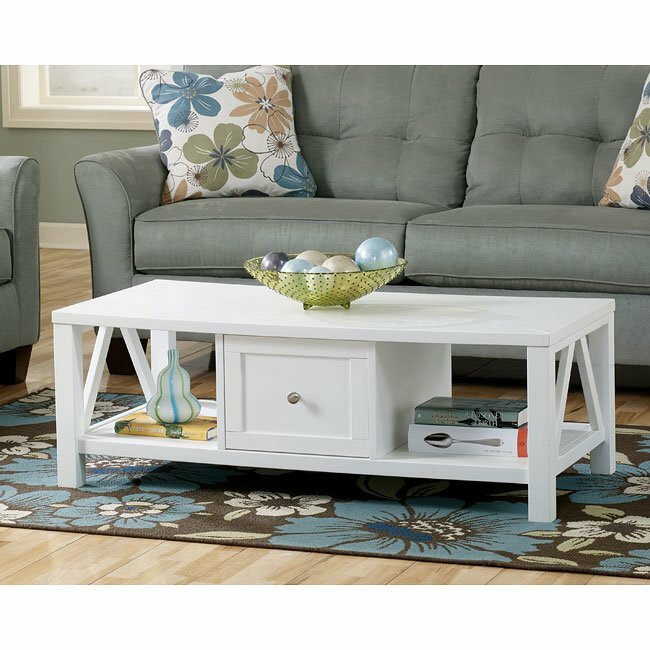 With a welcoming cottage style that enhances the beauty of any living environment, the Kailah Accent Table Collection by Ashley Furniture features a painted white finish flowing beautifully over the country design all perfectly complemented with the nickel color hardware. This elegant accent chair is the ideal choice for cosying up. 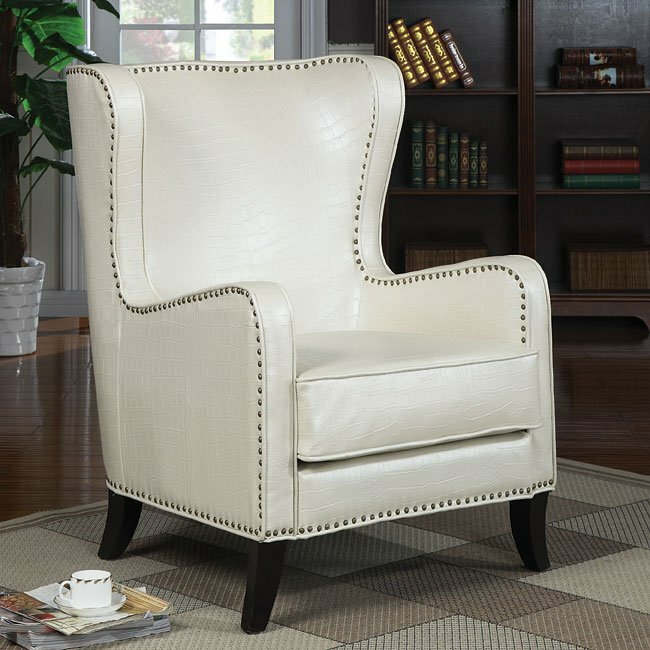 Featuring nailhead trim, tapered wood legs, and a white faux animal print across the whole chair, this unique chair is a smart furniture choice for your home. This gleaming white extending table combines practicality with sleek good looks and a real style statement. Team it with white Daryl Side Chairs for a crisp clean all white decor. 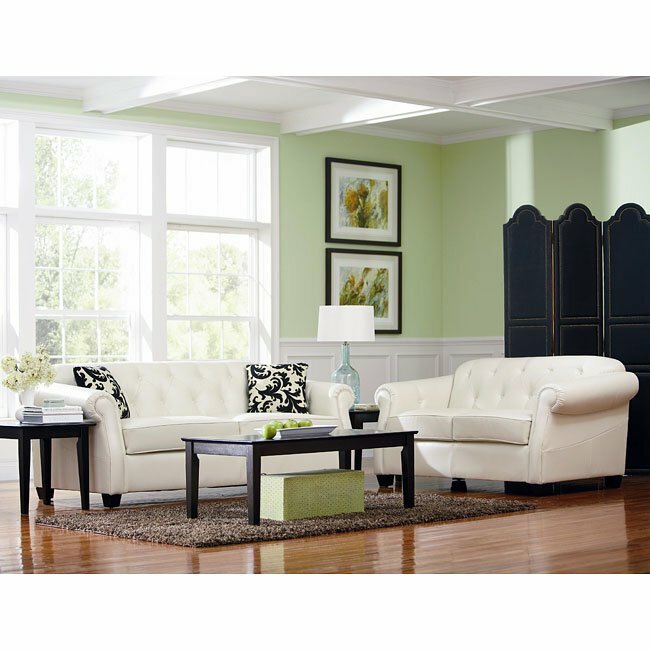 This luxurious, white leather corner chaise sectional is ideal for making the most of a smaller space. Upholstered in luxurious leather, make this glamorous sofa super cosy with a faux fur throw and snuggly cushions. White is often thought of as a summer colour, but when the weather’s dark and miserable outdoors white furniture can help bounce precious light around and make rooms look larger and brighter.